There are lots of tips on how to reduce puffy eyes. But how well do they work? Click Here: For more information and prices on the serum used in this video. NEW: Now available in travel/sample sizes too! I used to set my alarm about 15 minutes early each morning so I could sit with ice packs or cold cucumbers on my eyes in attempt to reduce reduce eye puffiness. Now I don't have to do that!! Within 5 minutes of swiping a thin layer of EES serum under my eyes, I look less puffy and sleepy. It's also a great treatment for under eye crepiness. 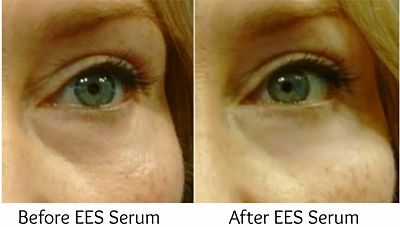 If you're like me you have probably tried a ton of eye lift serum products. But what I like about this one is that it is light...soothing and does not cause that dry powdery look that the others have done. You can work with this one and apply less or more as needed to get the results you need. So how to reduce puffy eyes? There are hundreds of different causes and reasons for puffy swollen eyes!!! I knew I didn't have a medical condition, so this information didn't help me much at all. Then I realized, I don't care about the causes - I just want a solution on how to reduce puffy eyes! Ok, so some home remedies worked a little but were too time consuming and didn't offer the dramatic results I wanted. I found this eye de puffer, eye lifter, anti-fatigue eye serum (called Easy Eye Solutions Instant Eye Tuck) that works in less than 10 minutes. It offers the dramatic results I want and lasts all day. It sort of acts like a girdle to gently pull-in and smooth the whole under eye area. And, it's not like those drying, sticky, gluey serums usually found in drug stores………..
Trust me, I've tried them too! This serum is very comfortable and seems to work well even on sensitive or very dry skin. Plus, you can apply this serum on top of your favorite moisturizer or makeup. The problem with the other serums (at least for me) is that they only worked if you applied it to clean dry skin. And, they would crack and peel when I smiled or moved my face. Note: Serum contains Acetyl Glucosamine and Hyaluronate to help strengthen and hydrate with regular use. I use this serum every morning. It's the last thing I apply after my moisturizer, sunscreen, and makeup. On days when I have dark shadows or circles - I apply the hydrating illuminating cream (under and above the eye area), then the serum. The illuminating cream contains reflective particles and small amounts of highlighter so it brightens the eye area. Good for those days where you have dark eye circles or look very tired. Still want to try some home remedies to reduce puffy eyes? Ok, with some extra effort and time, some home remedies and tips did help reduce puffy eyes a little bit. So, If you're interested trying them, return back to the Puffy Eyes Remedy section for more information. 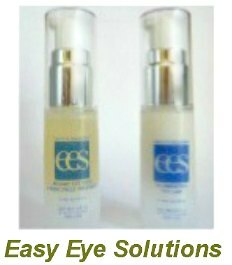 Otherwise, I urge you to try the Easy Eye Solution Instant Eye Tuck Serum, my favorite remedy to reduce puffy eyes. NOTE: If you're you're still on the fence about trying the serum - consider trying the smaller, less expensive sample size by following the link above. NOTE: For helpful information about under eye treatment tips and directions from regular users - Click here. 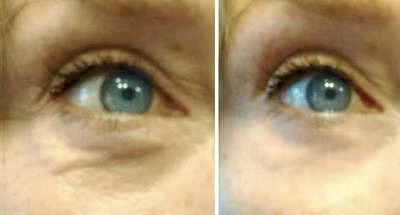 Is the Eye Tuck an anti aging skincare treatment for the eyes?